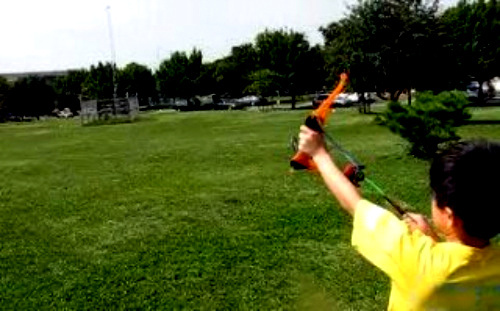 I am not sure if it was because of the movie Brave, that I fell in love with bows and arrows. Maybe it's because I was born in Korea and the South Korean Olympic Archery Team breaks world records all the time. All I know is that there is something really cool about archery and I needed to explore that after I saw a picture of the Z-Curve Bow in a toy industry magazine. This is an excellent reason to get outdoors! This has been successful indoors too! After trying out the Z-Curve, I found it to feel like it was something that really promoted focus and that is great news since for some reason,my momtuition tells me that the kids who need to focus more are the same ones who are very attracted to these toy bow and arrows. However, because the Olympics were underway, I really wanted to publish my review of the Z-Curve Bow quickly and so I was sad because I never got a chance to ask my fave occupational therapist, Aimee Prainito about her thoughts on the Zing Toys bows and arrows. Not long ago, at my request, she looked at both bow & arrow toys for the readers of Toys are Tools and I felt really good when I heard what she had to say. "I loved it, the kids loved it, the therapists all loved it," Aimee told me, as she described the first time she brought the Air Storm Zip-Bak Bow and the Air Storm Z -Curve Bow to a pediatric clinic. "Three OTs (occupational therapist) and a PT (physical therapist) were fighting over it, grabbing it! " said Aimee. "Everybody wanted it." 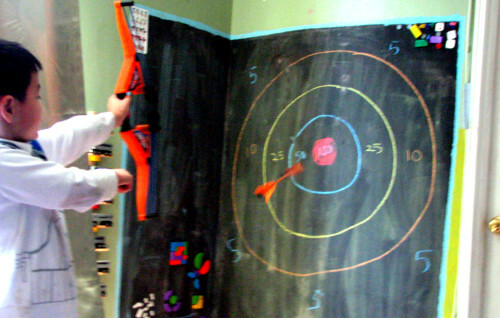 But why would an occupational therapist love a bow and arrow (aside from the fact that it's super fun)? "All of them were great because they all used bilateral integration skills, which is basically using two hands at midline." Aimee liked how you can use the vertical or horizontal position to launch the arrows. WHAT? She lost me at "bilateral integration." Whatever did she mean by that? "It’s a precursor to reading and writing," Aimee said matter-of-factly. "It has to do with reading and writing because you need to have a hand dominance," Aimee does a great job in speaking real-people-talk. "Then you need to stabilize with your non-dominant hand to do an activity." Aimee explained that if you can establish hand dominance then you can cross your midline. "Most of us when you’re writing correctly, we’re tilting the paper at midline," Aimee tried to describe it further. "If you’re right-handed, you tilt the paper a little bit to the left then you put your left hand on top of the paper and then you start writing and you actually cross the midline when you’re writing," she said. "You need to be able to hold an object with your hand to stabilize it and then use your dominant hand for the fine motor part." And that is how we do lots of things she told me, like threading a needle. Aimee, also mentioned that this type of exercise brought on by bow and arrow work encouraged better trunk control. Aimee, had established in another article here how core trunk muscles are really important to students in a classroom. "If you don't have good trunk control, you can’t sit up and you can’t pay attention." Wow, I wonder if I should make my guy do an hour of this everyday.... will he learn to sit up straight? Really straight? Forever? Heck, I could use good core trunk muscles myself. I'm all flab over there and am always sitting poorly. Learning to stabilize oneself is very important for reading and writing? I suppose that makes sense. 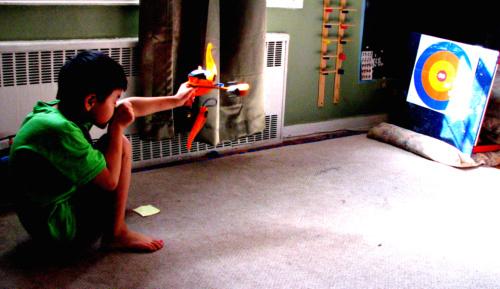 Aimee felt that precision targeting could not be wholly achieved with this toy. She also said, "But, I have to tell you something. The kids really didn't care. They loved shooting it." For me, the mom who knows nothing of midlines and core trunk stability, what I notice most is how my kids take turns watching each other shoot. Whether or not, they are playing with each other or friends. The kids would inevitably watch and wait for each other's turns. I love that. It's very much like skateboarding or singing in a karaoke bar. We slowly prepare for our own turn but the waiting part is quite entertaining because a friend is performing. Another thing that I like is that the Air Storm Zip-Bak Bow is smaller. 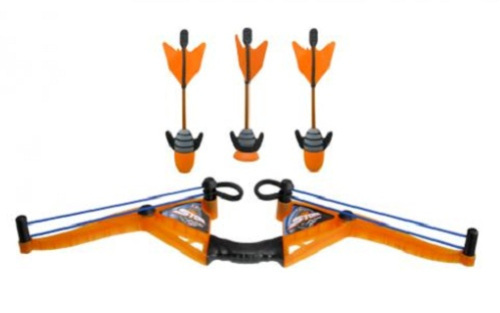 I know it suggests that kids play with this after they turn eight but my 5 -year-old really wanted to shoot an arrow so badly but the Z-Curve Bow was too big for him so that was a reason to get the Zip-Bak. After he started getting better on the Zip-Bak Bow, he was more capable of moving onto the the Z-Curve Bow. After talking to Aimee, I see these bows and arrows, not for the purpose of just practicing focus but also to support academic classroom skills! Wow! How cool is that? While I'm sure the bows and arrows will not turn them into Shakespeare, I think this is all going to help somehow. Seriously, though... if they can improve a few academic skills (even if it's just a bit) by shooting targets with a bow and arrow. Let's just say....as long as they hit the target that I set up for them, I have no problem with the shooting of the bows and arrows in my home. Can't wait to see if you've won? Try my Amazon links below and support Toys are Tools! Disclosure statement: Toys are Tools has not been compensated in any fashion by the manufacturer of any of the mentioned products for the publication of this post. 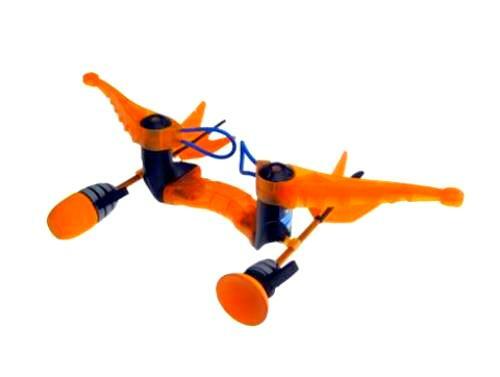 The product was given to Toys are Tools' testers and expert to facilitate a review. Reviews are never promised. I think this toy looks like a lot of fun. Because it's an arrow, maybe some folks won't like it but it's not a weapon really. It's a sport, right? 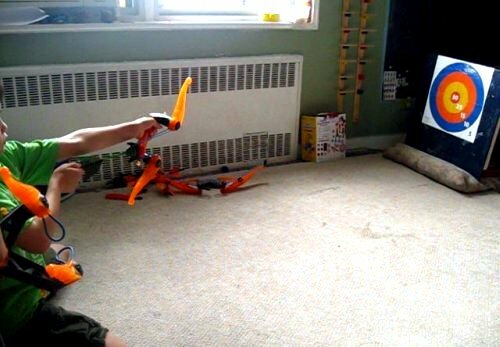 We have toy guns, toy knives, toy swords. It's not the same but looks just as fun! As for age.. it all depends on the child. I see what they are able to handle.